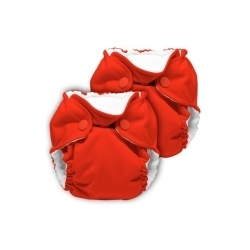 The Petite Bottoms Newborn AIO and/or Pocket Diaper Rental program is a great way to cloth diaper your newborn and try a variety of cloth diapers. You won't know what you like or what works for you or your baby until your baby is here. Choose the Prefold and/or fitted add on option for the best variety package that we offer! It is what many customers choose when purchasing newborn diapers at our store. 24 gently used or new AIOs and/or pocket diapers. You can choose to rent just AIOs or just Pocket diapers. If you would like to try both, choose the "Mixed" option at the time of check out. You will get 12 of each type of diaper. If there is a particular brand that you would like to try simply leave a note in the comments section. We will do everything possible to try and include it with your rental. - 1 Roll of disposable diaper liners for you to use and keep. - Cloth diaper safe rash cream samples for you to use and keep. At the time of checkout leave your estimated due date in the comments section. We will mail your rental to you two weeks prior to baby's estimated arrival. At the end of your 2 month rental simply put it in the provided postage paid return package and drop it off at your local post office. We will include instructions on how to package your diapers properly. If your baby should arrive early we can ship out your rental immediately. Local customers may choose to pick up their rental at our retail location, 26 Pleasant Street, Second Floor, in downtown Concord, NH or have it delivered to their door step! = $95 store credit or $45 cash back, upon the return of the rental package. Minus any damaged or not returned items and late fees of $5 per day. If you find that a certain AIO or Pocket diaper is not working for your baby please let us know. We can exchange it for one that does! You are able to customize your rental to work best for you. We have an add on option of 12 newborn prefolds or 6 newborn fitteds and 2 newborn covers for $25 each option. We have tried to keep the options and explaination simple and clear for those that are new to cloth diapering. We understand that having a baby can be over whelming and the choices for cloth diapering are many. We are here to help you pick the best rental program for you. If you need any assistance please stop in the store or call us at, 424-256-8448. By purchasing this package online or in our retail store you agree to all of the above and Petite Bottoms terms, conditions, explanations and requirements.